For high achievers, planning the day comes naturally. But how often do you take the time to actually process the day? Even the most productive leaders struggle to find enough distraction-free time to slow down, journal their thoughts, and grow in self-awareness. That’s why Michael Hyatt took his daily journaling routine and designed a physical journal that finally makes consistency achievable. Use it at the beginning or end of your day to make each one better than the last. Plenty of space to think deeply, just enough structure to keep you consistent. When you sit down to journal, the last thing you need is a page that feels as cluttered as the thoughts racing through your mind. Scrunching your reflections into tiny boxes and pre-numbered lists isn’t a recipe for clear thinking. Every day in The Full Focus Journal™ is built around a refreshingly simple 8-question template Michael Hyatt developed for his own use to not only make the writing easier, but to give you enough space to get to the good stuff. It gives you a track to run on, so you’ll never get stuck wondering what to write next. A single ribbon marker keeps your place and offers a subtle reminder of your progress, while the hardbound, cloth-over-boards cover ensures you can write on any surface, whether at your desk or in bed. We took special care to ensure the binding lays flat, so you’ll never have to use your free hand to keep it open. 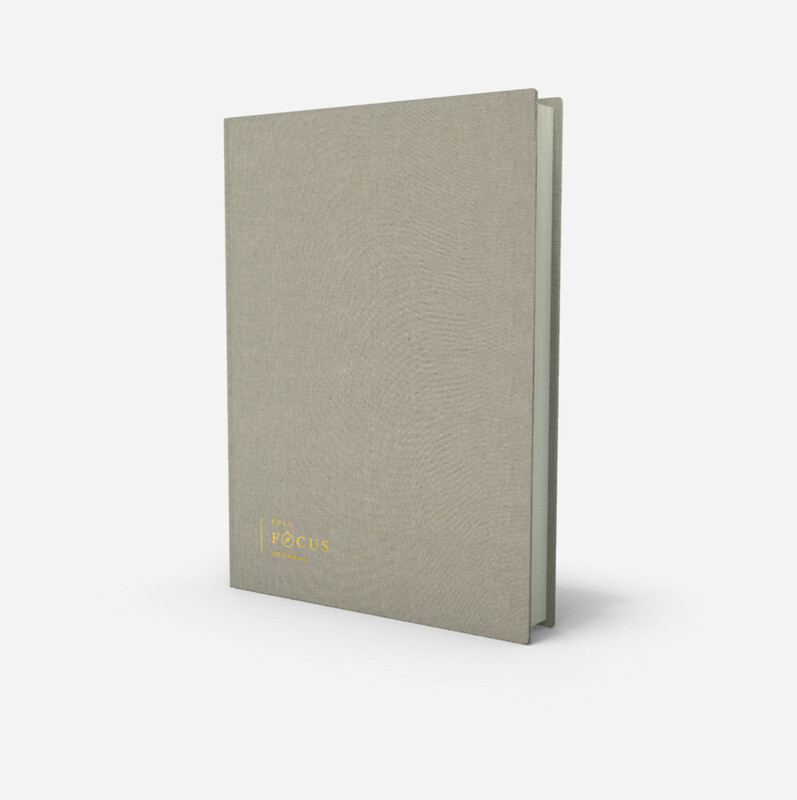 Finally, a journal that feels as good to write in as it looks. Simple questions help you quickly process the past 24 hours, so nothing of significance gets lost in the day-to-day whirlwind. Journaling isn’t just about what happened—it’s about understanding how and why things happen. 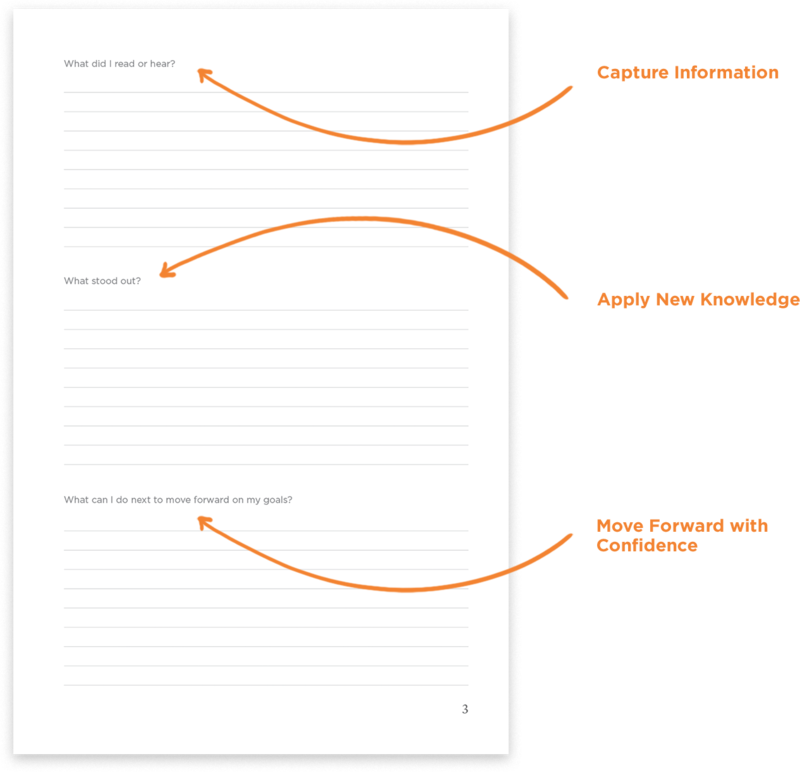 Context is critical for learning, and The Full Focus Journal™ ensures you always have it. Remind yourself of the things that count and replace any nagging thoughts and limiting beliefs with a refreshed perspective as you start or finish your day. 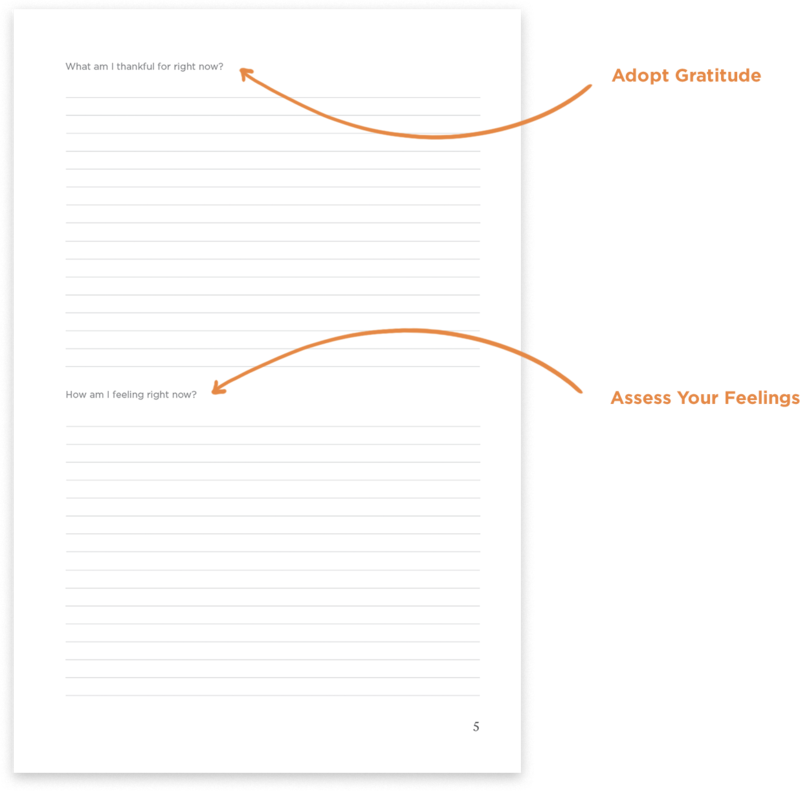 Watching your progress unfold in page after page makes it much easier to escape the overwhelm that keeps so many leaders from slowing down and growing in self-awareness. 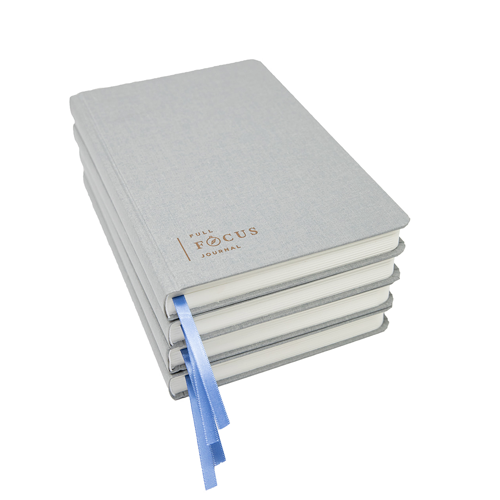 The Full Focus Journal™ is built on research-backed principles that make it easier to journal with consistency. 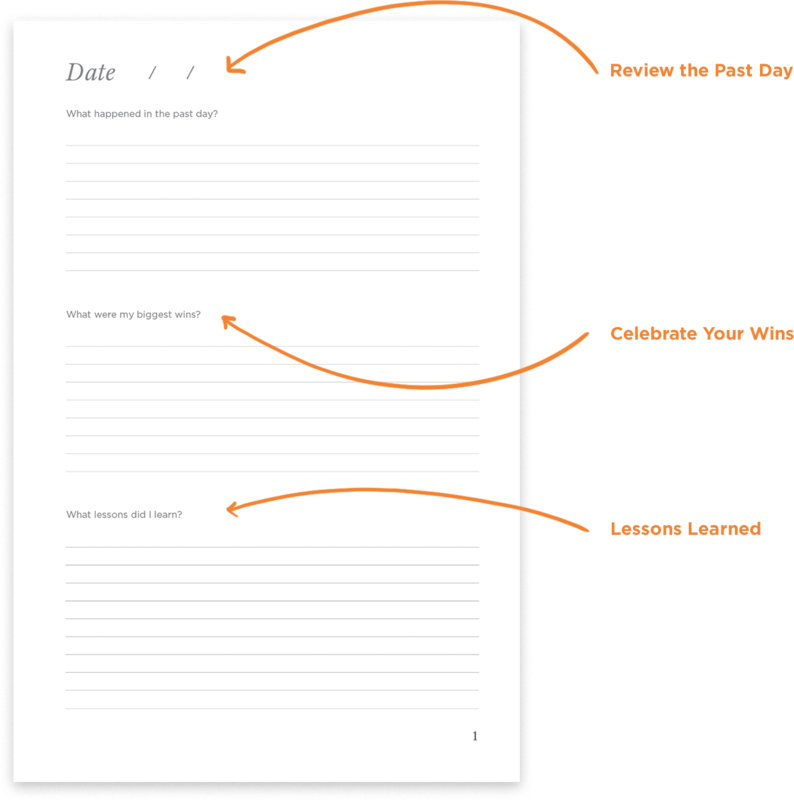 Michael’s daily journaling template gives you a consistent routine made up of eight questions that not only help you get words on the page, they make sure you’re actually learning and uncovering valuable insights. This gives you the sense of reward that research shows is so crucial to forming a habit and sticking it. The eight questions are broken into three parts. The first three questions help you record the important things that happened since your last entry, celebrate your wins, and identify lessons worth remembering. They make you more intentional with the meaning you assign your experiences—which is even more important than the experiences themselves. Slowing down gives you the rare opportunity to actually focus on the present moment. This page lets you use that moment to practice gratitude and acknowledge any feelings that are too difficult to detect in the whirlwind of daily life. What should you take with you into the next day? Answer the final three questions to build momentum and set a course that will help you move forward with confidence. You’re likely already aware of the numerous science-backed advantages of writing on paper instead of a digital device. Research has shown that handwriting helps you retain more information by engaging different parts of your brain and forcing you to more fully process your thinking. But the main reason Michael chose paper actually has little to do with writing. The fact is, journaling is just as much about giving yourself a chance to slow down and experience a moment of calm as it is about the actual writing. Too often, our digital devices keep us plugged into the day-to-day chaos and distractions that make it so hard to gain clarity in the first place. With a paper journal, you’ll not only get all of the benefits of handwriting—you’ll also get the increased mental clarity that comes with reducing screen time. Order a single Full Focus Journal™ or choose the annual subscription and we’ll make sure you start each quarter with a fresh journal. You’ll save 10% and never have to worry about missing a day and getting thrown off your routine. Domestic shipping is a flat rate of $4.99 per shipment within the 48 contiguous United States. International Shipping (including Alaska, Hawaii, and APO/FPO boxes) are calculated based on location. Once you enter your address information on the purchase page you will see the shipping charges populate for your individual order. ***For annual subscriptions, please be aware that the shipping charge you pay upon checkout is a one time charge, paid with your order, and will not be recurring with each shipment. This one-time shipping charge covers all four deliveries! Annual subscriptions ship to United States only. We stand behind our products and want you to have the best value possible. If for some reason you aren’t 100% satisfied with your journal, return it for a full refund within the first 30 days after delivery. Also, annual subscriptions can be cancelled at any time without penalty. If you have any questions regarding our refund policy, please contact our customer experience team at support@fullfocusjournal.com. 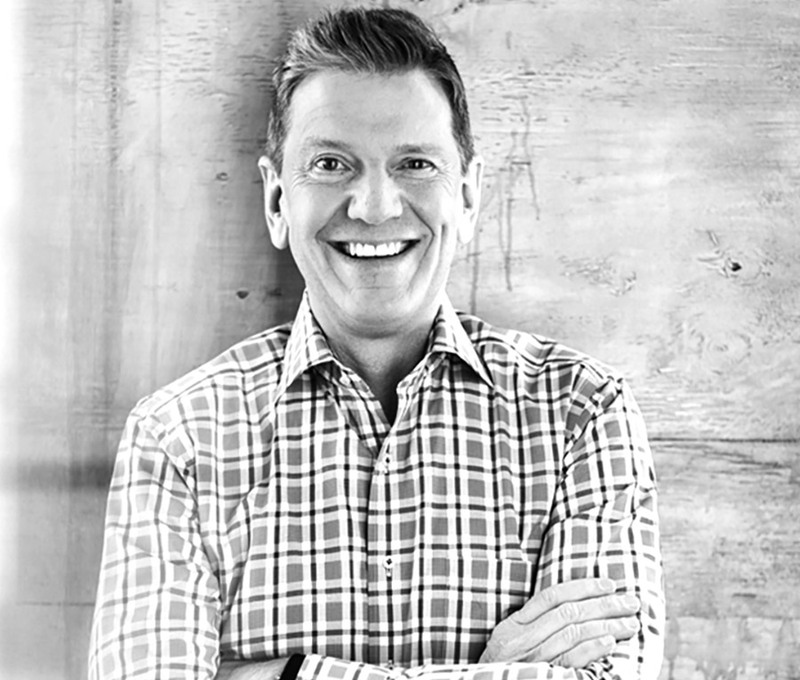 Michael Hyatt is the founder and CEO of Michael Hyatt & Company, an online leadership development company helping overwhelmed high achievers win at work and succeed at life. He is the author of Platform: Get Noticed in a Noisy World, a New York Times bestseller, and Living Forward and Your Best Year Ever, Wall Street Journal and USA Today bestsellers. Formerly the CEO and Chairman of Thomas Nelson Publishers, Michael is an entrepreneur and the creator of several highly successful online courses, including 5 Days to Your Best Year Ever™ and Free to Focus™. His popular leadership blog and podcast reach over one million people a month. He and his wife of 38 years, Gail, have five daughters and eight grandchildren. Single journal: Domestic shipping (within the 48 contiguous United States) is a flat rate of $4.99. Annual subscription: Domestic shipping (within the 48 contiguous United States) is a fee of $4.99 per yearly subscription. You will pay this shipping charge upon checkout, and it will not be recurring until your yearly renewal. International Shipping: (Including Alaska, Hawaii, and APO/FPO boxes) are calculated based on your location. Once you enter your address on the purchase page, you will be given the shipping charges for your individual order. I live outside of the US. Do you ship internationally? Yes! We’re excited to be offering International shipping to most countries, with the exception of North Korea, Cuba, Iran, North Sudan, and Syria. We unfortunately do not offer international shipping for Annual Subscriptions at this time. Additionally, special requirements may be encountered for shipments to Russia. We recommend USPS Priority Mail International for shipments to this country. Can you ship all 4 journals in my Annual Subscription at one time? In an Annual Subscription, a new journal ships every 80-85 days, so each arrives before the 90-day mark. Single journals ship all at once, regardless the quantity you order. Therefore, if you need multiple journals in one shipment the single journal option would best suit your needs. The Full Focus Planner® is a complete system for planning and tracking your everyday tasks, quarterly targets, and yearly goals. It’s a tactical tool for acting on both your day-to-day and year-to-year priorities, complete with templates for conducting weekly and quarterly reviews. 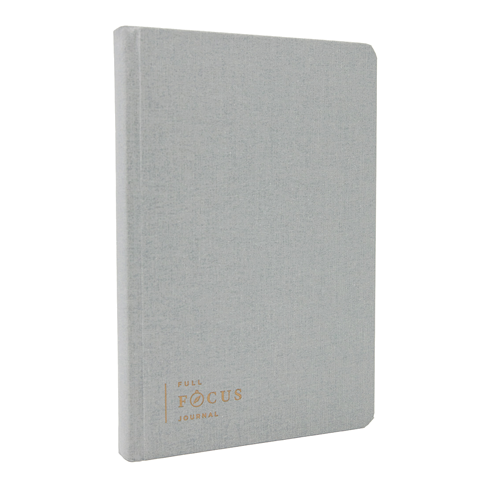 The Full Focus Journal™ is designed specifically to help you build the habit of daily journaling, so you can slow down, process each day, and grow in self-awareness. How does the annual subscription work? What are the advantages of getting one? 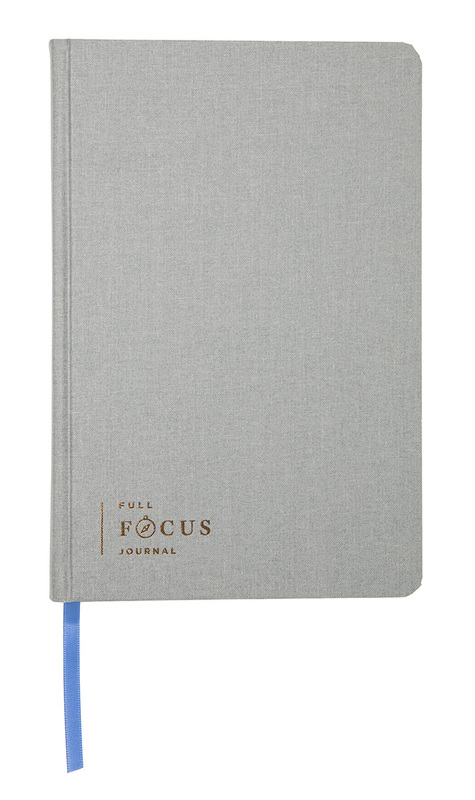 The Full Focus Journal™ is designed for 90-day journaling periods, so an annual subscription gets you four journals per year. You’ll save 10% by paying once up front each year, and you’ll automatically receive a fresh journal every 90 days. It’s much simpler than ordering a single journal every time you need a new one. You can cancel anytime without penalty. Like a magazine subscription, your annual journal subscription will renew each year until you cancel. 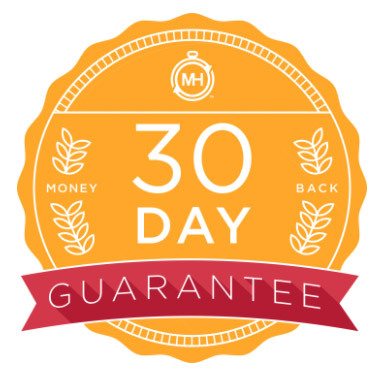 Plus, you still have access to our 30-day money-back guarantee—so if you receive your first journal and decide it’s not for you, you can get a full refund in the first 30 days. 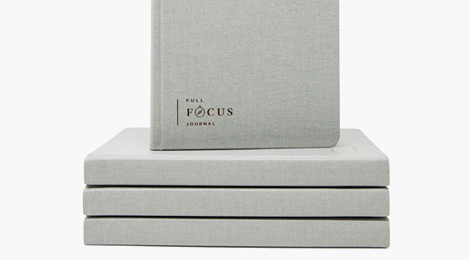 When will I receive my first Full Focus Journal™? All pre-ordered journals will ship by the end of May. Domestic shipment delivery times can range from 3-8 days, and internationals shipments take up to 14 days. You will receive tracking details once your order is shipped so you can keep an eye out for delivery! How can I view/manage my annual subscription? Click here to create an account! Be sure to use the same email address you used to purchase. Inside your account, you can update your address, view your upcoming orders, update your payment information, and more! Absolutely. You’re always protected by our 30-day money-back guarantee, and it starts from the day you receive your journal in the mail. 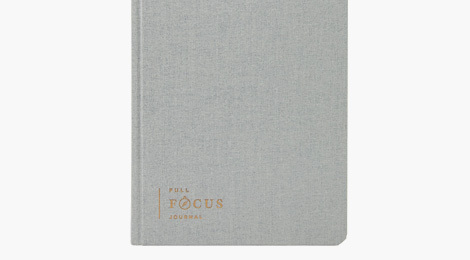 If you decide this is not the journal for you then simply reach out to us at support@fullfocusjournal.com, and we’ll make sure you get a full refund within the first 30 days from the date of delivery. This also applies to the first journal of your annual subscription, so your subscription order is entirely risk-free. Following our 30-day money-back guarantee, annual subscriptions are not eligible for cancelation and refund. However, subscription renewals can be canceled at any time without penalty. I’ve tried paper journals in the past but couldn’t get the habit to stick. What makes this one different? Michael’s proven eight-question journaling template prevents you from starting from scratch when you sit down to write. Instead of wondering what to write, you’ll answer the same simple questions every time. The questions are also designed to ensure that you learn something from each entry. That built-in sense of reward makes building the habit much easier. Doesn't Michael use Day One (an electronic app) for a journal? Why use a paper journal? Michael used the 8-question template in Day One for years. But after researching the benefits of paper, he decided to switch to writing in a physical journal. There are many benefits to using paper instead of digital. But the main benefit for Michael is that it allows him to slow down even further and have deeper reflection. On a digital device, you're still plugged into the busyness, which makes it harder to slow down. With paper, you're allowed to unplug and slow down, and this provides for greater clarity in journaling. For this reason, he's switching to using The Full Focus Journal™. How can I attach a pen to my journal? There are many options out there but Michael is currently using this! I’d like to use this journal on a digital device. Can I get a digital version? Will you ever create a journaling app? One of the biggest benefits of daily journaling is the chance it gives us to slow down and unplug from the constant distractions of digital devices. We think you’ll enjoy the break from the daily whirlwind if you give it a try. Also, research shows that our brains like paper more than screens. We learn better, remember more, process more thoroughly, and understand more fully when we write things down rather than when we type them out. Something about the tactile experience of writing pen-to-paper creates a productive boost for our cognition. Michael does love digital solutions when they improve productivity. Down the road, we may consider something digital if it would be a positive addition. Right now, we’re convinced that there’s a huge value in analog for this journaling tool. What are the specific dimensions and details of the journal? 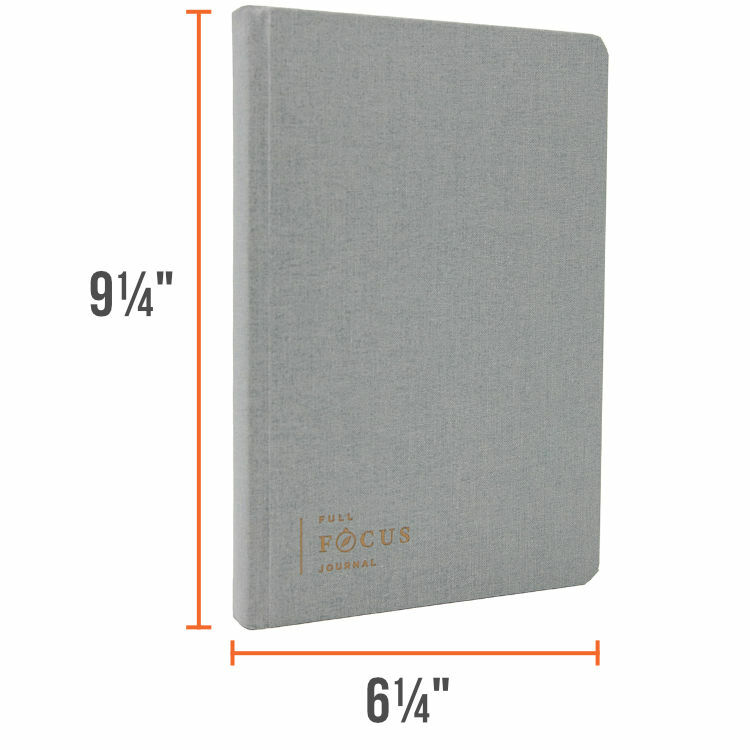 The Full Focus Journal™ gives you 90 days of journal entries so you won’t feel overwhelmed by an entire year’s worth of blank pages. The entries are undated, allowing you to get started any time of the year. Do I need to be familiar with the 5 Days to Your Best Year Ever™ and Free to Focus™ courses to use this journal? No. The journal is a standalone product that includes our proprietary framework for easy journaling. You do not need to be familiar with any of our other products to enjoy the benefits of daily journaling. If the journal goes on sale after I purchase, can I take advantage of the sale price? We are more than happy to honor promotional pricing for all customers who have purchased in the prior 30 days from the start of any current promotion. Our team will issue a partial refund in the amount of the difference between your purchased price and our sale. If you have an Annual Subscription, we’ll be sure your future renewals match the special pricing as well. Do you have an affiliate program? Can I get credit if I refer someone to the journal? Currently, we do not have an affiliate program for this product.